The inaugural ISA Try Sailing Invitational under the ISA’s Try Sailing banner, will take place this July hosted by the Royal Cork Yacht Club, Crosshaven, Co Cork, Ireland, as part of the highly successful Volvo Cork Week. It represents one of a number of initiatives under the ISA’s Try Sailing banner aimed at introducing as many people as possible to the joys of sailing. “The ISA Try Sailing Invitational invites sailing clubs around the country to put together a team comprised of participants in their try sailing programme’s. Each club who enters a team can nominate one experienced sailor to either skipper their entry or be part of the crew. Racing will take place in 1720 sports boats over five days with challenging but enjoyable inshore racing. -Colin Morehead, Try Sailing coordinator at the Royal Cork Yacht Club and Access & Participation policy group member with the ISA. This event hopes to develop valuable bonds between try sailing participants and the clubs they represent across the country and to give them an appreciation for what a large sailing regatta is all about – play, sail &amp; enjoy. 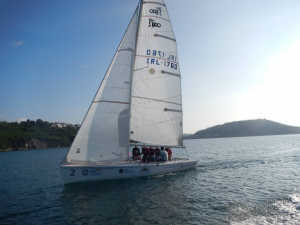 The ISA Try Sailing Invitational represents a fantastic opportunity to further enhance participation in the sport of sailing through racing in the natural maritime amphitheatre that is Cork Harbour – the largest natural harbour in the northern hemisphere. Make the choice to be part of a very special Regatta with a unique social aspect, by committing to compete for the ISA Try Sailing Invitational at Volvo Cork Week in Cork Harbour, Ireland, July 2016.